Remember that period in your life when countless government agencies were all fighting over you? Oh wait, that never happens – unless you’re The Rock. Professional wrestler, actor, and Herculean bicep connoisseur, Dwayne Johnson, is quite simply one of the nicest guys in Hollywood. He’s also an absolute machine in the gym – so strong in fact, one man genuinely thought to ask the Royal Navy this question. But everyones favourite muscleman didn’t explicitly refuse to join the navy. So could this be the revamp that sea warfare has needed in the past century? Admiral Nelson stand aside. 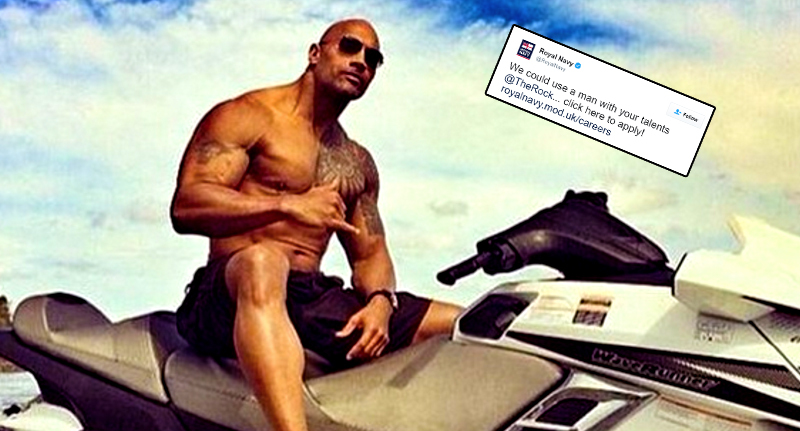 Dwayne Johnson’s here to show you how it’s done.